Making the Old New Again!! HERE WE HAVE THE HEAD MOUNTED ON THE MILL. BE SURE TO GET IT LEVEL IN BOTH DIRECTIONS OR THE BOLTS WILL BE CROOKED WHEN YOU GO TO PUT THEM IN. TAKE YOUR TIME HERE ...THIS IS IMPORTANT. ONCE YOU HAVE IT LEVELED UP AND TIGHTENED DOWN MAKE SURE TO BLOW THE HOLE OUT AND MAKE SURE IT IT CLEAN INSIDE. 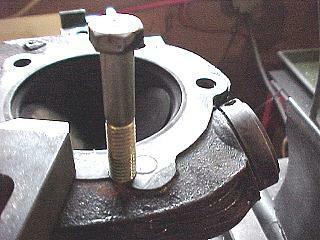 NEXT YOU CAN TAKE YOUR OLD HEAD BOLT AND PUT SOME LOCKTIGHT ON THE BOLT. (GREEN PREFERABLY, BEARING LOCK BUT RED WILL DO IF IT IS ALL YOU HAVE) THEN TIGHTEN IT INTO THE BOLT HOLE THAT WE ARE GOING TO ELIMINATE. GRUNT IT DOWN TIGHT AS IT IS GOING TO BE IN THERE FOR GOOD. ONCE TIGHTENED IN YOU CAN CUT IT OFF WITH A HACKSAW. I WOULD SUGGEST A NEW SHARP BLADE WOULD BE A GOOD INVESTMENT HERE. SOMETHING WITH FINE TEETH. WE ARE USING A 24 TOOTH BLADE AND IT CUTS JUST FINE. 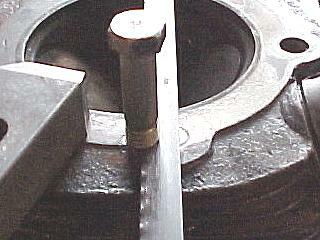 USE LIGHT PRESSURE AGAINST THE BOLT AND LET THE SAW WORK ITS WAY THROUGH THE BOLT. 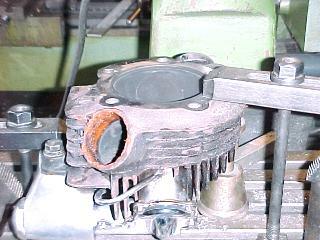 KEEP A WATCHFULL EYE ESPECAILLY ON THE OTHER SIDE OF THE HEAD GASKET SURFACE THAT THE SAW DOES NOT TOUCH DOWN AND SCORE THE HEAD. 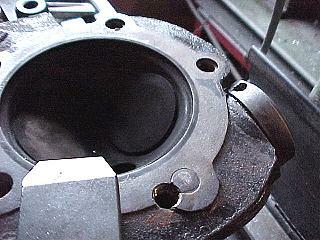 ONCE IT IS CUT OFF WE CAN CONCENTRATE ON THE OLD ORIGINAL KNUCKLE BOLT HOLE AREA. 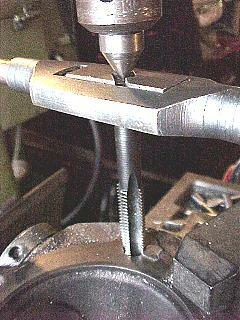 YOU WILL SMOOTH THE CUT OFF BOLT END AREA WITH A SANDING DISC OR FILE LATER. 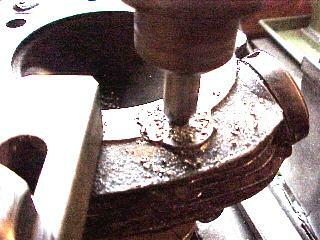 NEXT FIND THE CENTER OF THE PLUGGED HOLE THAT YOU WANT TO OPEN AND CENTER PUNCH IT. START WITH A CENTER DRILL MAKING SURE YOU ARE IN THE CENTER OF THE PLUG BEFORE YOU DRILL TO DEEP. CORRECT IF NECESSARY AND THEN STEP DRILL IT, (START WITH A SMALL DRILL TO DEPTH AND THEN STEP UP A A FEW SIZES UNTIL YOU ARE AT THE 25/64TH SIZE FOR TAPPING FOR THE HELICOIL WE WILL INSERT AFTER IT IS TAPPED. IF YOU ARE DOING IT RIGHT WHEN YOU REACH A 3/8'S DRILL SIZE IT SHOULD LOOK LIKE THE PICTURE ON THE RIGHT ABOVE. 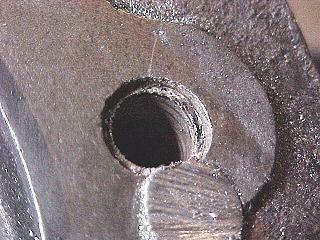 HERE YOU CAN SEE THE STOCK COUNTERBORE OF THE HOLE AND SEE THAT YOU HAVE INDEED BEEN DRILLING DEAD CENTER IN THE HOLE. 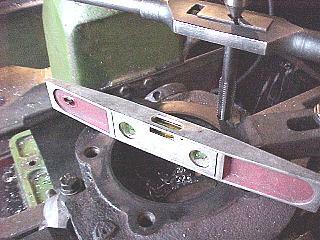 ONCE YOU HAVE DRILLED THE LAST HOLE THEN IT IS TIME TO TAP IT OUT. SET UP THE HELICOIL TAP AND PROCEED TO TAP THE HOLE. THIS IS A GOOD TIME TO TAKE A QUCIK CHECK TO AMKE SURE NOTHING HAS MOVED. JUST LAY A LEVEL ACROSS THE HEAD BOTH WAYS TO CHECK. IF EVERYTHING IS GOOD....PROCEED. IF YOU PUT A CENTER IN THE MILL YOU WILL BE ABLE TO FEED IT DOWN SLOWLY AS YOU TAP AND KEEP THE TAP CENTERED AND STRAIGHT ALL THE WAY DOWN.